Instagram has become the most popular social media platform for sharing images. The social media behemoth boasts 300 million active monthly users. The plethora of image editing options like the use of filters has put it ahead of the pack when used as a promotional tool. With 70 million uploaded photos per day, and over 30 billion total photos shared, Instagram isn’t showing any sign of slowing down. However, Instagram isn’t just for selfies and cat photos. Brands all across the globe are using Instagram to reach their customers for one reason. It works. L2, a New York-based research firm, released a study that shows that Instagram offers the highest conversion and most customer engagement for brands. The report also showed that 92% of all luxury brands who posted on Instagram 5.5 times per week (on average) netted more customers. Instagram lets you tell a visual story and allows you to connect your brand with customers on an emotional level. Research also shows that customers like to engage with brands on Instagram. A report by Forrester evaluated 249 brand profiles and 11.8 million user interactions on 2,489 different posts and showed that Instagram's per-follower interaction rate was at 2.3% in 2015. This may not sound like a lot, but Instagram is far ahead of all other major social networks in this measurement including Facebook (.216%), Twitter (.027%), Google+ (.044%) , LinkedIn (.055%), and Pinterest (.042%). The good news is that you don’t need to be a billion-dollar brand or a hip luxury boutique to market your business successfully on Instagram. This blog post will show you who the biggest brands are on Instagram and illustrate novel ways that they are using the platform. With over 50 million fans, National Geographic is the most followed non-celebrity brand on Instagram. This scientific and educational brand posts contributor photos from all across the world. From sub-saharan Africa to Antarctica, National Geographic shares stunning photos and stories of the places and people who inhabit the earth. What makes National Geographic so successful is that they don’t just post photos, they tell stories. Nat Geo does this by turning Instagram posts into compelling, mini-magazine features. Every posted photograph is a high-quality, compelling image that inspires emotion in the viewer. The description box is filled with detailed copy about the photo, relevant hashtags, and is also used to tag everyone involved (reporter, subject, photographer) for maximum reach, engagement and visibility. Retail brands fail on Instagram when they turn their account into a virtual closet. Users want to feel something when they scroll through an account, not just look at products and descriptions. Nike is a brand that understands how to use Instagram. Nike shares photos that embrace the fitness lifestyle rather than just showcasing products. For example, Nike won’t simply display a running shoe in a post. They’ll share a photo to their 46+ million followers that embraces the running lifestyle by showing how important it is to just get started running rather than the glory of winning a marathon, advocating that progress is more important than perfection. This creates an emotional connection in the viewer that evokes feelings of the pain, determination, motivation, and struggle that are involved with becoming a dedicated runner. This emotional connection bonds people with the brand, encourages them to engage with Nike, and creates trust which ultimately leads to sales. Bigger isn’t always better when it comes to Instagram. You don’t need millions of followers to win customers. Califia Farms is a small California-based natural beverage company, but their Instagram presence is much larger than their 34,800 Instagram follower count would suggest. Califia stands out from the pack with their award-winning package design and they have used Instagram as a platform to showcase their creativity. Their posts feature their packaging in creative ways within the context of their healthy lifestyle branding. 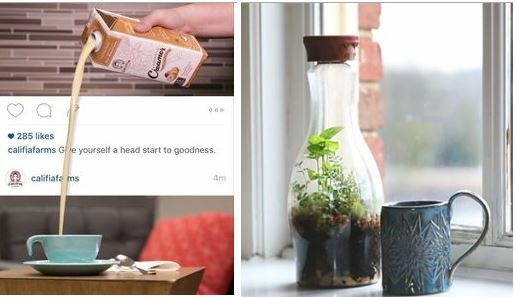 Califia shares interesting videos, pics, and GIFs that their fans love. Customers relate to the quirky, playful, and unique vibe that makes following Califia Farms fun. Office supplies aren’t very interesting, but Staples does a great job of making the them intriguing on Instagram. 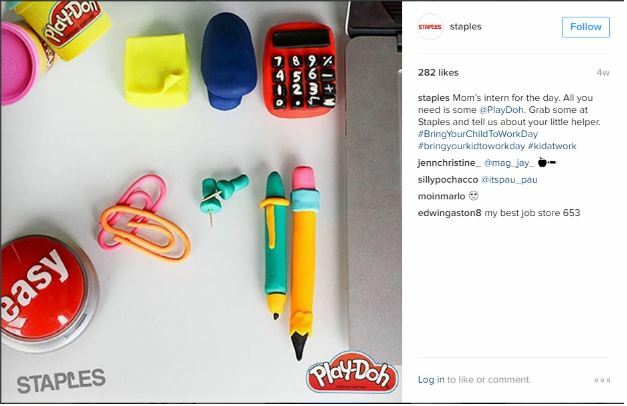 Staples uses their Instagram account to engage with their 21,800 followers and encourages them to interact with their brand. To engage with their customer base, Staples uses a lot of call-to-actions in their captions and descriptions. They also share very playful, lighthearted content, but manage to stay consistent with their brand by always involving office supplies in some way. GoPro is unique in that it features user-generated content almost exclusively. GoPro has a Photo of the Day contest to encourage people to submit content to their site. The daily winner has their photo or video shared with GoPro’s 9+ million Instagram followers. GoPro also likes to promote their sponsored users with their account. They do this using contests or sharing content from their sponsored partners. GoPro creates buzz and fun around their brand by allowing their users to curate the GoPro Instagram account. The companies mentioned above have managed to create engaging, addictive, and effective Instagram accounts by focusing on connecting with their users through emotion and maintaining a strong, consistent brand image. To have similar success in your business, you must streamline your brand. A style guide is essential to creating a brand with a strong foundation. Getting started with a style guide doesn’t have to be a difficult process. Making and updating a style guide should be easy, quick, and fun. With Frontify, you can create a gorgeous, web-based style guide in minutes. Frontify style guides are easy to make, edit and share. Create your free style guide today!